Wellington Road: I am prolific. Sort of. I have received the Prolific Blogger Award from one of my new favourite blogs, ‘Cross the Pond. 'Cross the Pond brings back memories of baffling electrical outlets, a futile search for accommodation, and shopping in a mysterious supermarket. Do have a nosy at her story about getting settled in a new life overseas. 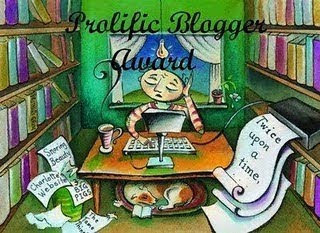 Every winner of the Prolific Blogger Award has to pass on this award to at least seven other deserving prolific bloggers. Each Prolific Blogger must link to the blog from which he/she has received the award (see above). Every Prolific Blogger must visit this post and add his/her name in the Mr. Linky, so we can see the other winners. For my seven winners, I am choosing a few of my favourite prolific bloggers. Congratulations! ...That's it, FROG. You go away on business and I shall tend to the business of usurping my Prolific Blogger Award, HAHAHAHAHA!!! Thank you for sharing the wonderful award with me, Juli. Congratulations on you receiving it.I know I enjoy reading your blog. Just found you via the ExpatBlog site. I'm very much enjoying my reading! Looking forward to seeing more.